In many eras of the past, books were the luxury of the wealthy – bound to suit the individual. As the literate public increased and its appetite for books followed, publishers began to take on the task of producing elaborate bindings. The industrial revolution enabled the process of binding to become more automated, and more elaborately decorated bindings could be mass produced. A mechanical process allowed cloth bindings to be imprinted, stamped and gilded to resemble the fine bindings traditionally produced by hand. 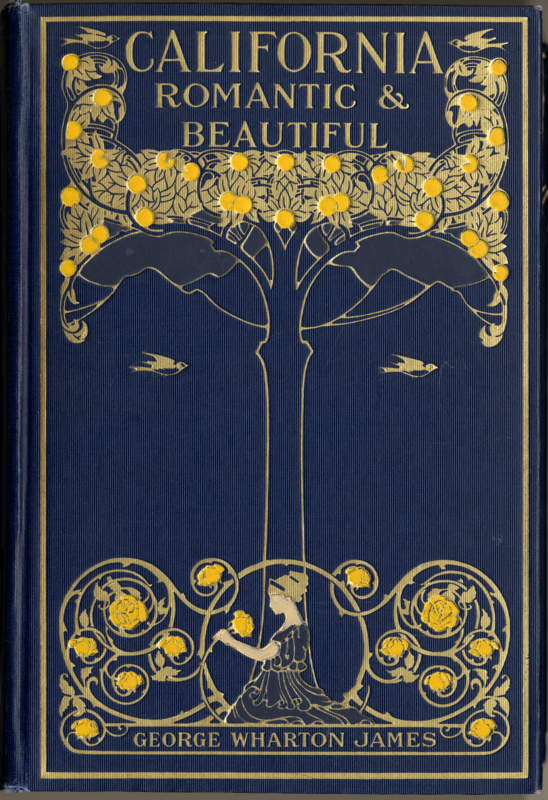 Publishers’ bindings enjoyed popularity from 1830 to the end of the 1930s when they were replaced by decorative dust jackets – or printed paper covers placed over the cloth covers of a book. This exhibit illustrates the types of decorated bindings produced from the mid-19th century through the first half of the 20th century. The titles are all from the Alice Phelan Sullivan Library, and are displayed in somewhat chronological order as well as being grouped by topic or subject. Click on any cover to enlarge the image. The two books displayed above represent two of the more elaborate bindings in our collection. 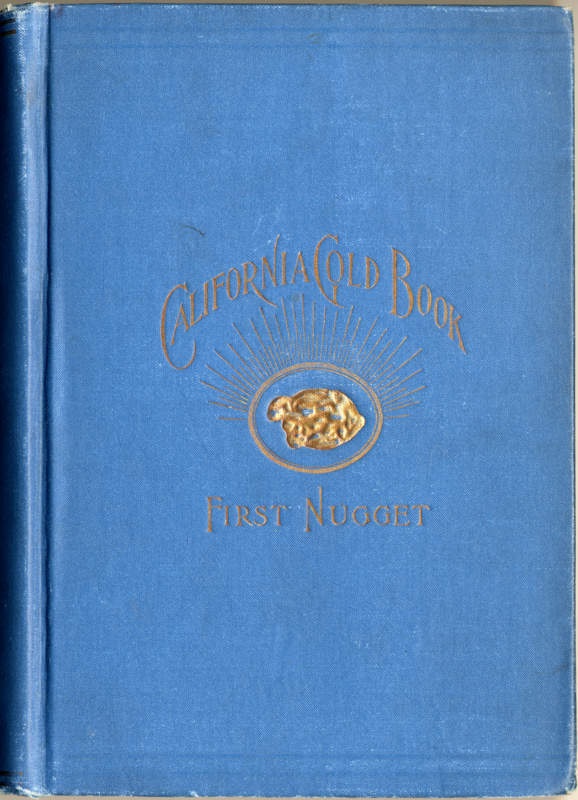 California: The Land of the Sun (1914) reproduces in color an actual painting that has been imprinted on the book cover, along with a decorated border, while California: Romantic and Beautiful (also 1914) employs an Arts and Crafts design beautifully done in stamped gold and color. 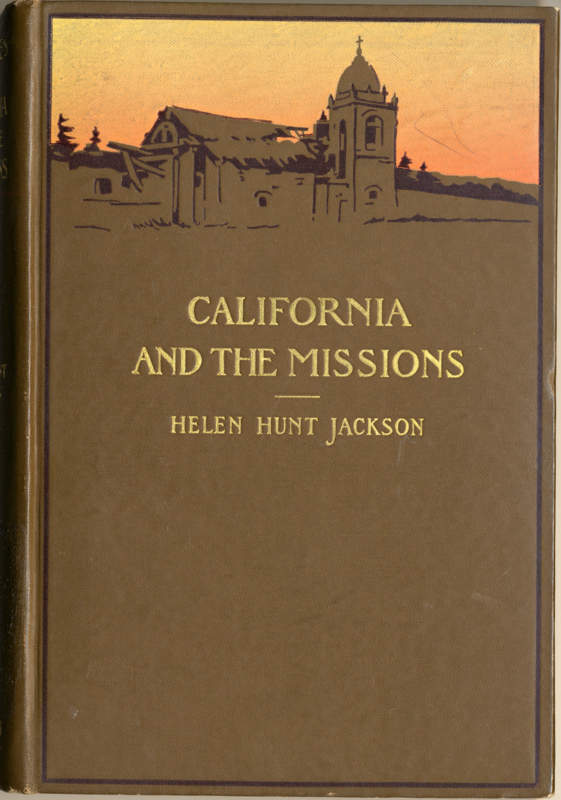 In and Out of the Old Missions of California: an historical and pictorial account of the Franciscan Missions. 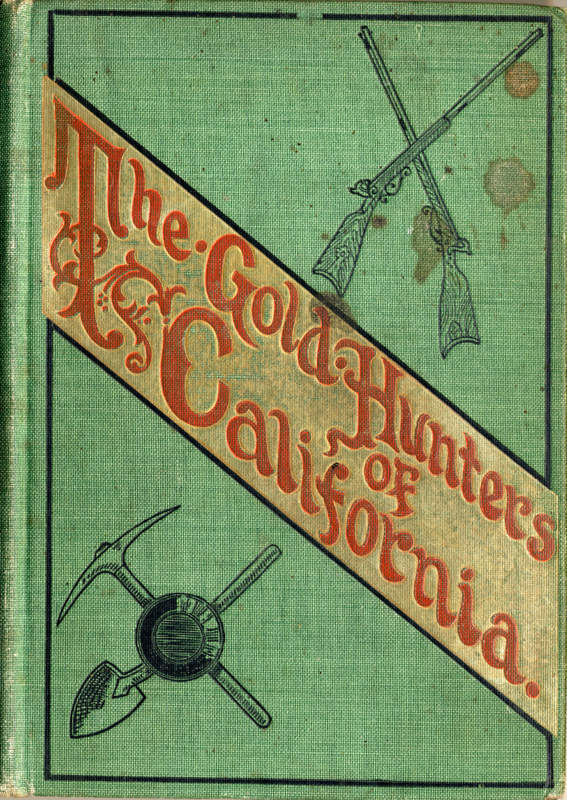 Books on California’s Gold Rush and pioneers often – rightly so – employed gold gilding and stamping on their covers. 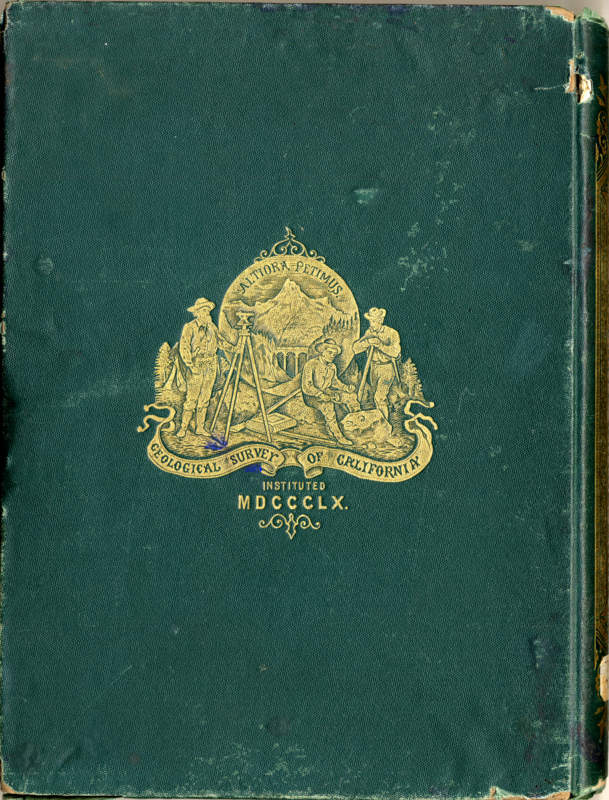 Ranging in years from 1891 to 1904, these books demonstrate the use of all three mechanical processes – imprinting (gold mining pick and pan and guns), stamping (gold miners and decorative lettering), and gilding (the gold nugget and the miners). 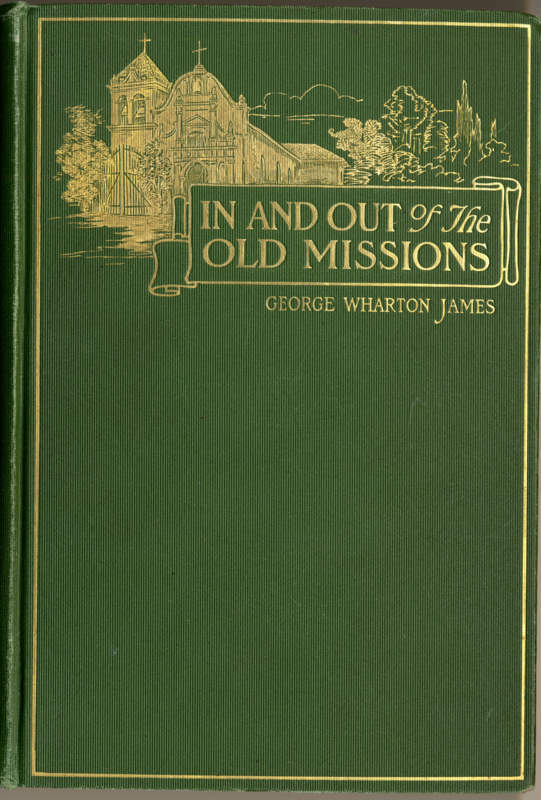 The restoration of the California missions began to take hold at the turn of the century, and many decorative bindings were produced for this topic. Palo Alto: The San Francisco News Company, 1902. 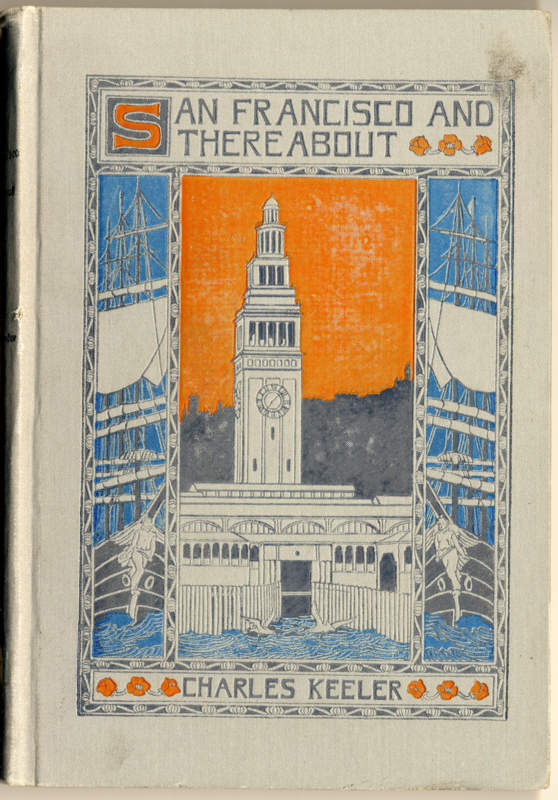 Books on the lush and prolific flora of California lent themselves to decorated bindings. 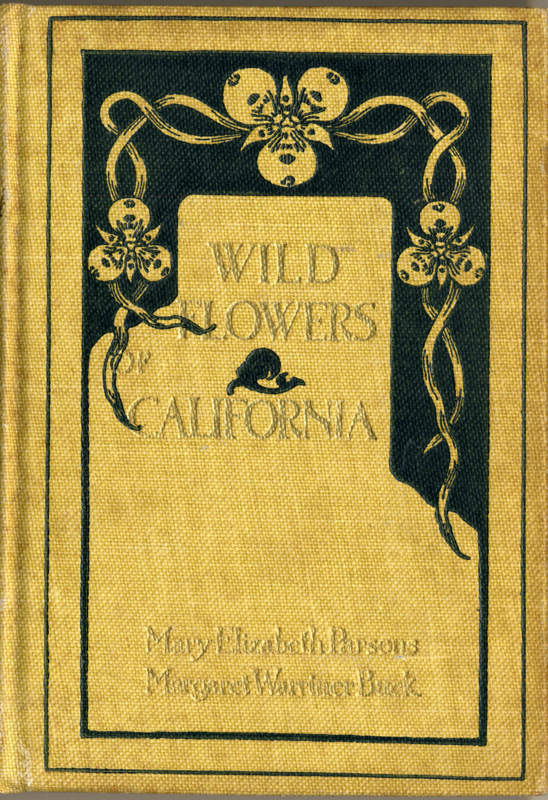 Shown above, Wild Flowers of California (San Francisco: William Doxey at the Sign of the Lark, 1897) is in the Arts and Crafts style again with the use of a decorative floral pattern. 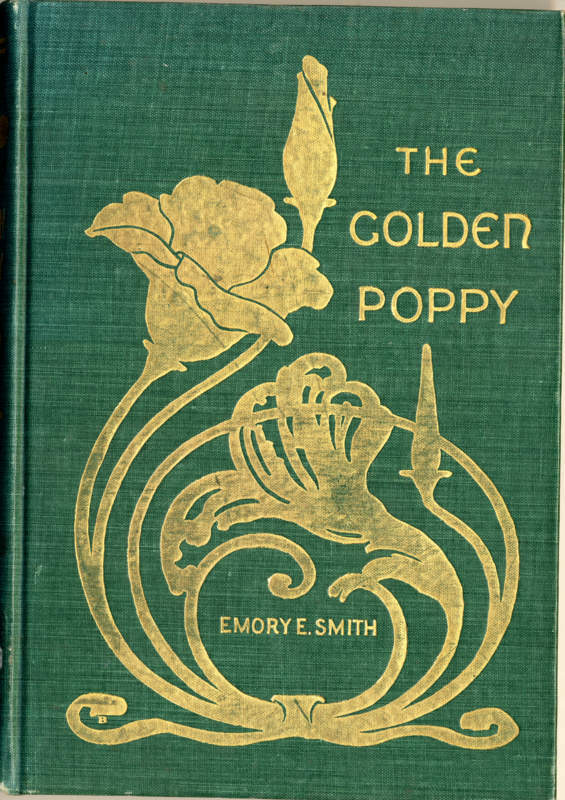 The Golden Poppy (Palo Alto, 1902) uses stamping in gold to emphasize the stylized image of the poppy on its cover. And finally, Semi-Tropical California (San Francisco: A.L. Bancroft, 1874) uses gilt stamping to create a detailed image of workers picking fruit. 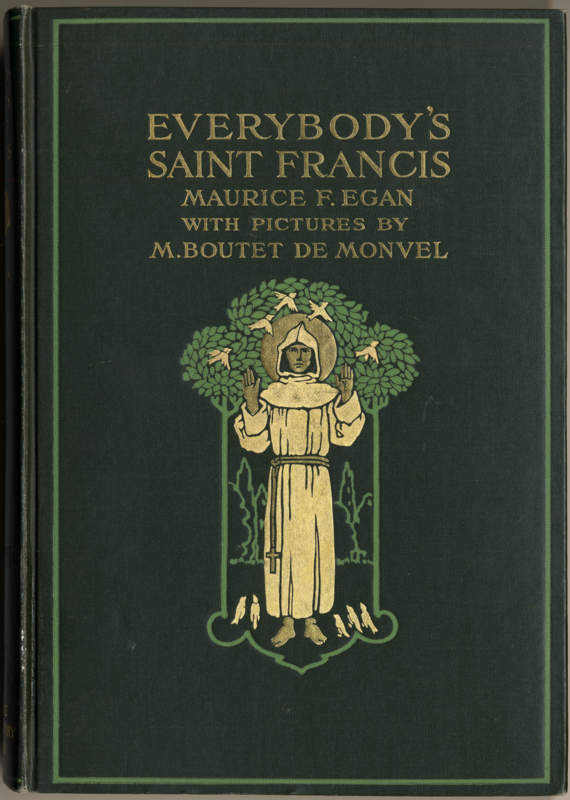 This image may well have been taken from either an engraving or photograph and transferred to use on the book cover. 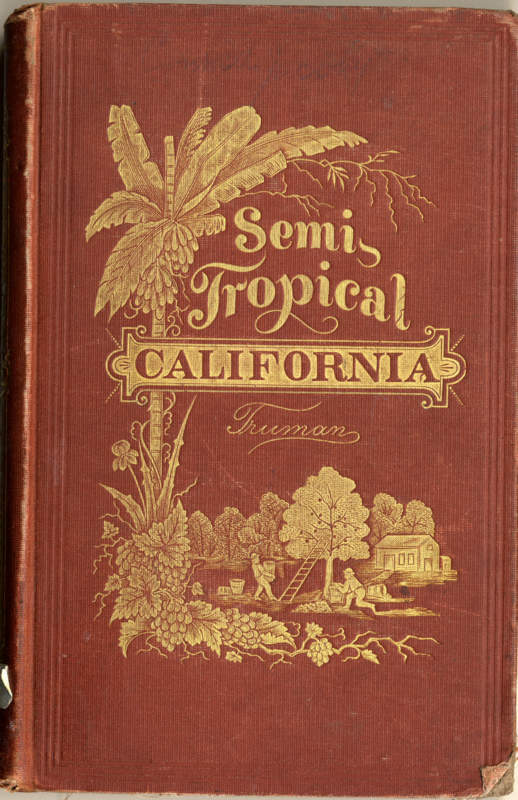 The cover also illustrates date palms and grape vines – all products of the abundant agricultural riches of California. 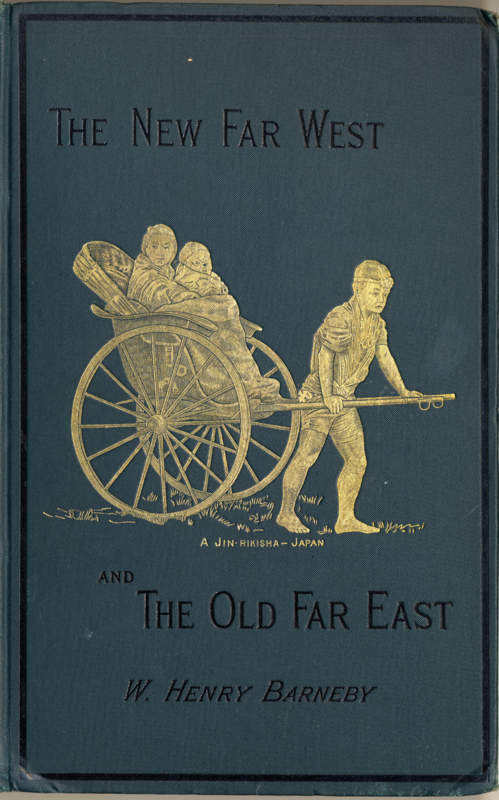 These covers above – The New Far West, The Old Far East (1889), Jack Henderson Out West (1905) and In Tamal Land (1906) – all use imprinting, some with color and other in gilt. 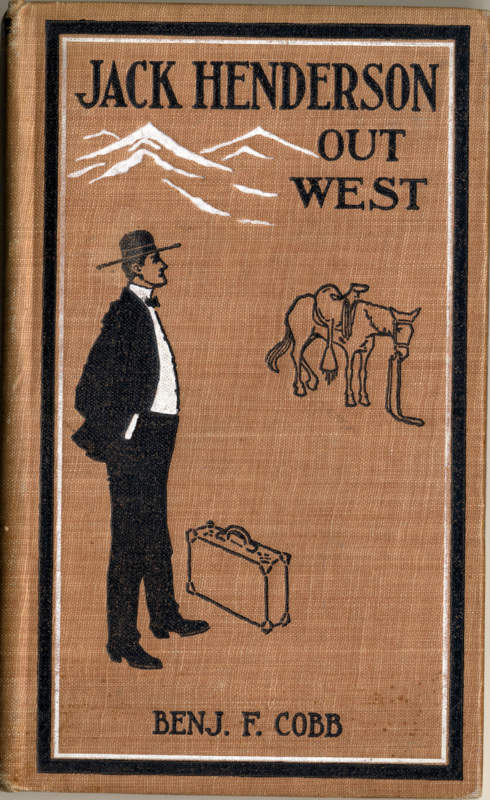 The New Far West title has a detailed image, once again most likely owing its design to a photograph, whereas the other two titles are much more modern in their design – In Tamal Land is reminiscent of the woodcut medium which was popular at this time in American art. 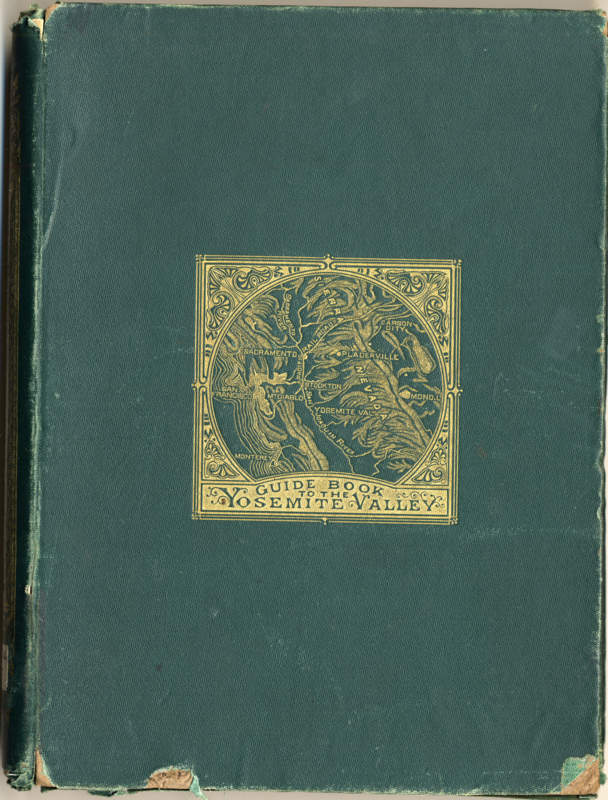 Guide Book to the Yosemite Valley. 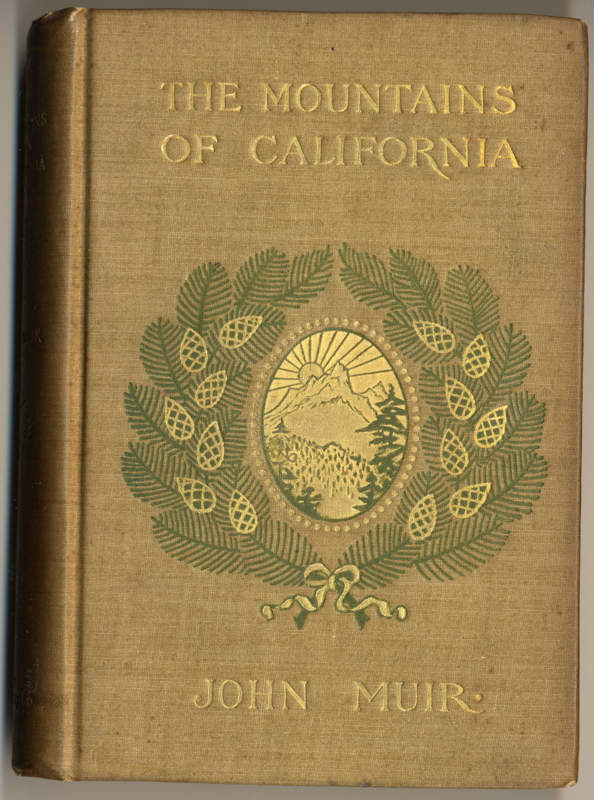 The beauty of California’s landscape always inspired decorative covers – and these three titles – Guide Book to the Yosemite Valley (1869), California Coast Trails (1913), and The Mountains of California (1894) by John Muir – still employ the imprinted gilt to accentuate their cover designs. 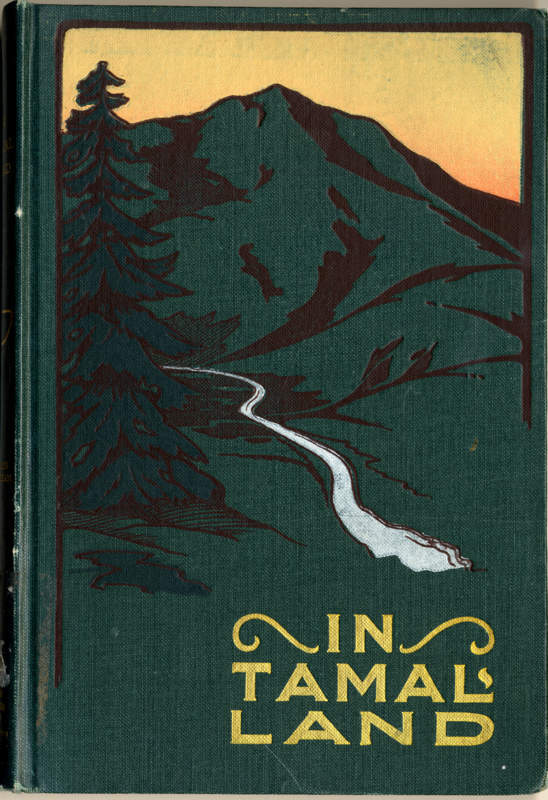 The Yosemite title reproduces a map on the cover in gilt which appears often in many other books on Yosemite, and its image was taken originally from an engraved map. 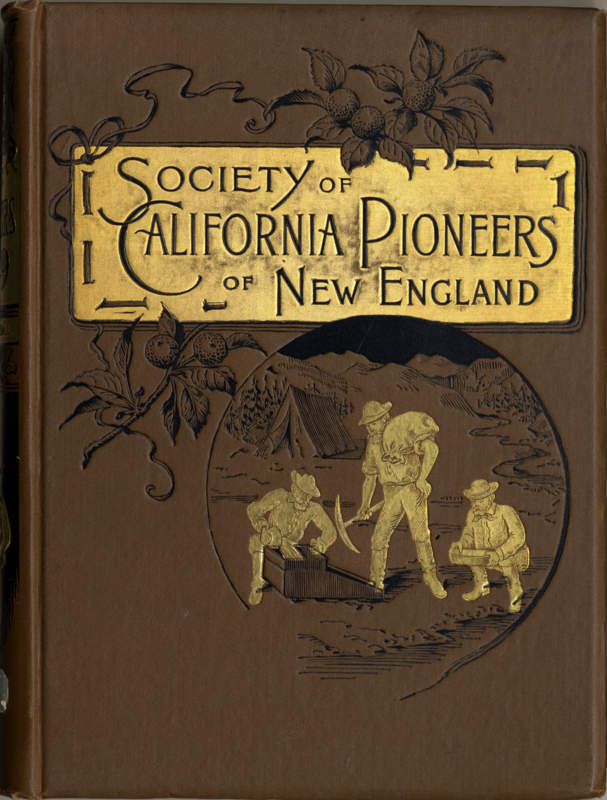 This book also has a wonderful gilt image on the back depicting geologists from the U.S. Geological Survey – the co-authors of the book. 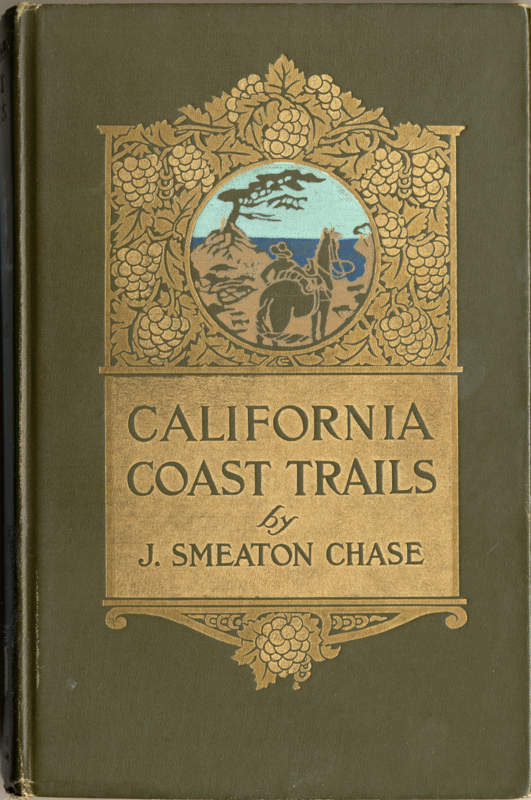 The two other titles, in the Arts and Crafts style, utilize flora representative of each scenic location – a Monterey Pine and grapes for the coast and pine boughs and cones for the mountains. Gift of George N. Patterson. Gift of Mrs. Ethel Woodward Glenn. 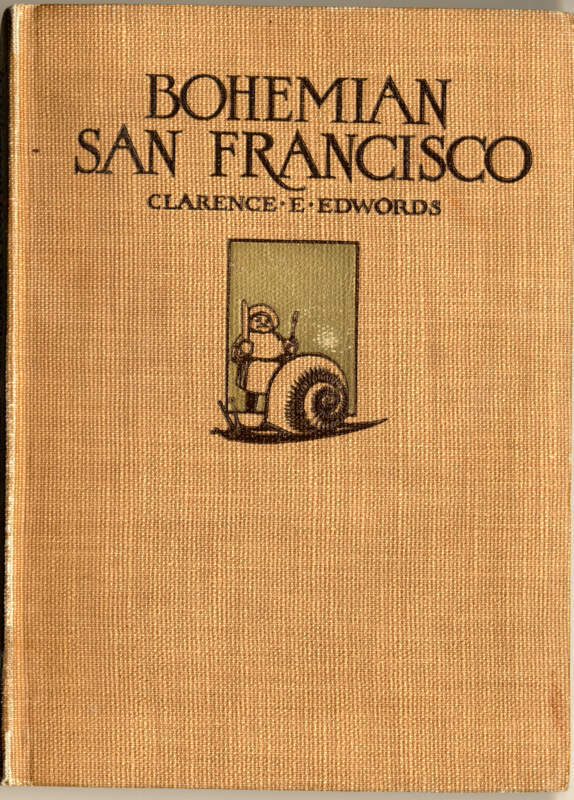 These last three titles – spanning the period from 1902-1914 – are representative of the trend after the turn of the century toward more restrained designs. 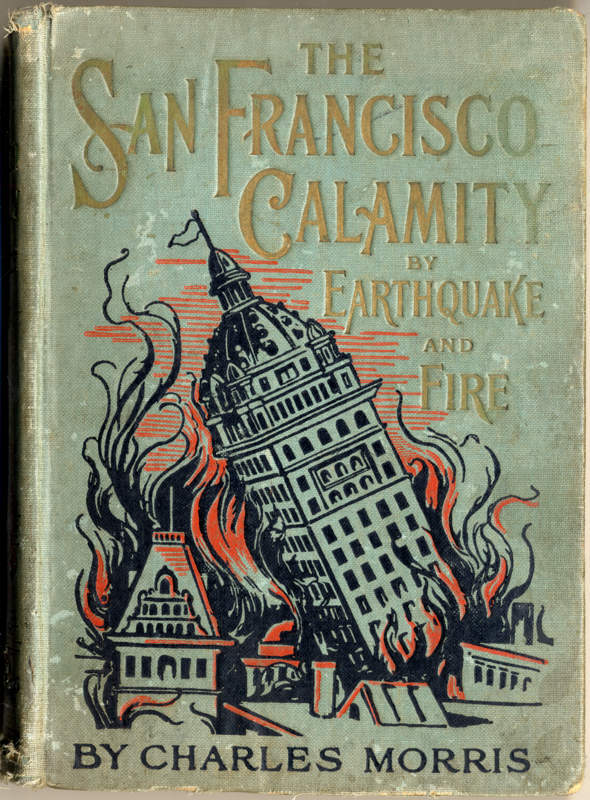 While the title on the earthquake is still quite pictorial, utilizing color and design to graphically and boldly represent the “Calamity”, the other two titles are much less exuberant in their design and utilize imprinting as well as gold much more sparingly to represent the topic of the book. 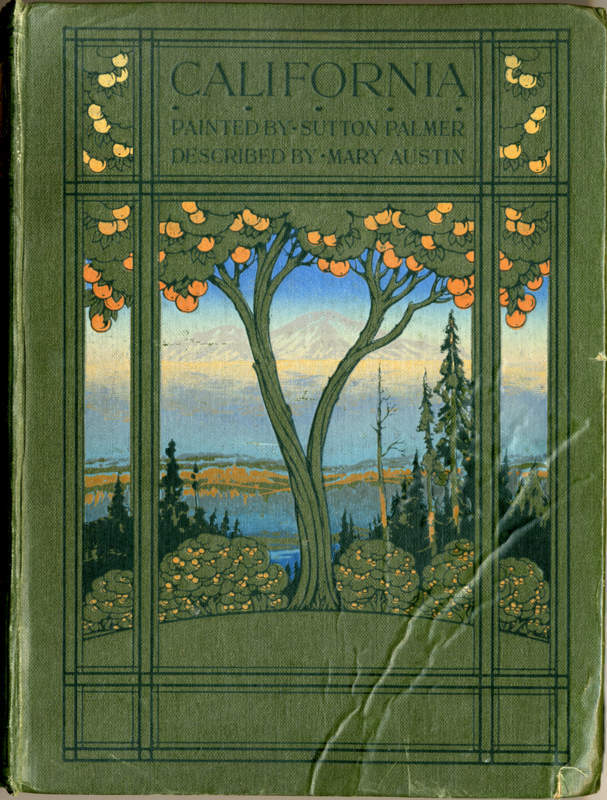 Many of the rare books in our Alice Phelan Sullivan Library’s reading room feature unique cover art and gilding, often the work of talented but uncredited illustrators. Although we’ve all been warned not to judge a book by the cover, these beautiful volumes are an exception and reward a second look.